This deliciously crisp beer is perfect for a hot summer day. The delicate taste of apricots gives a splash of sweetness to the crisp, clean wheat ale and results in a refreshingly pure flavour sensation. Bottle: Poured a light golden color male with a medium white foamy head with good retention. Aroma of apricot and wheat malt is pretty refreshing and enticing. Taste of apricot is more dominant then I had expected with not off-flavours or flavours enhancer with a nice dose of bubblegum wheat notes. Body is about average with good carbonation. Nice fruit beer and prefect for those hot summer days. Appearance- Pours a hazy marmalade with a half a finger width of bubbly head that quickly fades. Taste- Starts with wheat followed by light apricot and honey. Slight touch of lemon is present. Mouthfeel- Medium bodied with moderate carbonation. A little sticky. Overall- A crisp and refreshing Apricot Wheat Ale by Cannery Brewing. The apricot flavour is kept light and avoids being overly sweet; however, I would have preferred if there was more apricot flavour in the beer. Definitely perfect for the summer patio weather. On tap at St Augustines in Vancouver. A: Hazy honey colored liquid with 1/4" white head. Cannery's Apricot Wheat pours a bright, light gold. They suggest serving it with the yeast, so I swirled the last bit and added it. The aroma is mild, sweet apricot, with a hint of dry, grainy wheat. The apricot taste and sweetness come through a bit more in the flavor, with some crisp, light wheat. A little more graininess comes through in the finish. The apricot flavor tastes a little artificial, but I could see it being refreshing on a hot summer day. Appearance. Pours a slightly cloudy, amber-gold with a finger of bubbly white head. Smell. Toasted light grain, canned peaches. Taste. Roasty wheat, a little apricot and sweetness, but nothing too excessive. Mouthfeel. Medium-light body with bubbly, medium carbonation. A little alcohol. Overall. Not much of a real apricot taste and a little too much grain for me. A - Pours a hazy golden orange with a thumb of head. Head dissipates slowly leaving minimal lacing. S - Sweet orange zest, floral apricot, though slightly metallic on the finish. T - Was slightly disappointed with the apricot flavour as it was rather mild. Finishes with a sweet vanilla flavour, a wheaty grassiness and a bit of a woody scent. M - Very light on the palette and goes down very smooth. Perfect summer bevy! D - Overall a delicious ale, though it could have had a bit of a stronger apricot flavour. By no means offensive, but had the potential to be stellar. Cloudy orange with a nice foamy white head. Apricot, wheat and hops in the scent. Somewhat sour, more so than other fruit/wheat beers I've had. Pleasant sweetness lurking in the background. Bitter-sweet apricot taste. Strong wheat profile, somewhat milder hops. A bit of banana and maybe citrus in there too. Good mouthfeel - best served cold and enjoyed on a nice summer day. Apricot Wheat Ale is a hazy orange-tinged golden beer with a bright white head that erupts as it's being poured. I'm loving it. The head dissipates rather quickly making way for the rest of the bottle. The aroma is of clean and dry wheat and, of course, apricots. The basis of the beer is the American style wheat ale. Normally a boring style. 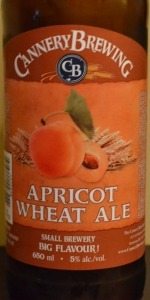 Again Cannery does it right with the addition of apricot making it lively, delicious, and most importantly, refreshing. 650ml bottle. Sort of the wrong time of year for this kind of offering, but what the hell. Made with wheat and apricots, duh. This beer pours a rather hazy, medium golden yellow colour, with two chubby fingers of puffy, rocky, and sudsy off-white head, which leaves some thinly layered cloud form lace around the glass as it slowly fades away. It smells of sweet n' fruity apricot, a bit of musty peach, some soft wheaty graininess, white bread, a touch of field honey, and very tame earthy and leafy green hops. The taste is again replete with a fresh apricot/peach orchard fruitiness, some pleasantly innocuous grainy wheatiness, a hint of lemon peel, more softly sweet honey, and a still rather muted earthy, leafy, and floral hoppiness. The carbonation is mild, with just a lilting frothiness presiding, the body just on the low side of your typical middleweight, and fruit pithy in its smoothness. It finishes off-dry, the guys with their names on the building closing up shop. Overall, Cannery's Apricot Wheat Ale is a nice, refreshing, well, fruity wheat ale - balanced, and not overly sweet. I could totally see enjoying a pint or two of this on a sunny patio overlooking the orchards and vineyards of the Okanagan. From a 650 ml brown bottle, brand new product from Cannery. Pours out a cloudy marmalade/amber hue, two fingers of spongy white head that slowly settles. Predominant aroma is light apricot with a little bit of tart wheat in the background. Regarding the flavour there's good news and bad news. I'll share the good news first.... The apricot flavour is decent and is well contained, is not a full-blown overwhelming runaway train, but a nice touch. The bad news is the tartness of the wheat is a bit overwhelming and seems to take everything over by the finish, into a very awkward almost earthy and tart/bitter aftertaste. Well carbonated mouthfeel yet still on the thin side. If the wheat could be toned down and rounded out a bit with maybe a bit more barley/less wheat on the grain bill Cannery would have something here. Either that or amp up the apricot presence, but that would just be drowning out the issue with more volume--like drowning out your annoying noisy neighbours by cranking your own music up--the current apricot level is just fine as it is.